Abstract art uses form, color and line to create a composition which exists outside of visual reality. From the Renaissance up to the middle of the 19th century, Western art had been based on the logic of perspective and was generally an attempt to reproduce an illusion of visible reality. But by the end of the 19th century many Western artists felt a need to create a new kind of art that reflected the fundamental changes taking place in technology, science and philosophy. The sources from which these artists drew their inspiration were variously different — they reflected the social and intellectual concerns in all areas of Western culture at that time. 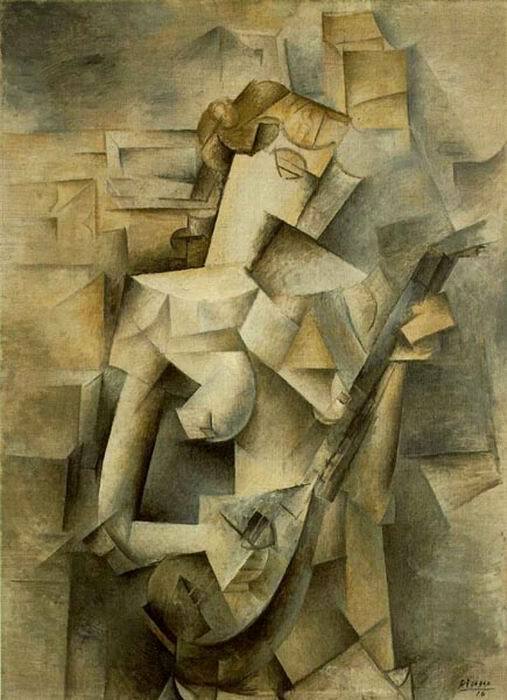 Picasso: Woman Playing the Mandolin (1909). Abstract art, non-figurative art, nonobjective art, and nonrepresentational art are related terms. Abstract art does not attempt to represent external, recognizable reality but tries to achieve its effect using shapes, forms, colors, and textures. Pablo Picasso made his first cubist paintings based on Cézanne’s idea that all depiction of nature can be reduced to three solids: cube, sphere and cone. Although Cubism does depend on subject matter, it became, along with Fauvism, the art movement that directly opened the door to abstraction in the 20th century. The collage artists, Max Ernst, Man Ray and others taking the clue from Cubism were instrumental to the development of the movement called Dada. Dada was an early 20th-century international movement in art, literature, music, and film, repudiating and mocking artistic and social conventions and emphasizing the illogical and absurd. 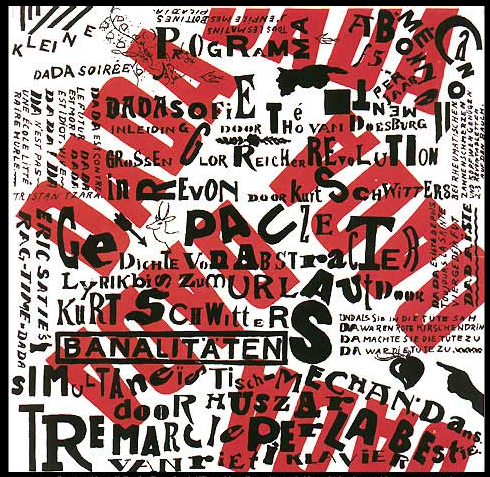 Dada was launched in Zurich in 1916 by Tristan Tzara and others, soon merging with a similar group in New York. It favored montage, collage, and the ready-made. Leading figures: Jean Arp, André Breton, Max Ernst, Man Ray, and Marcel Duchamp. 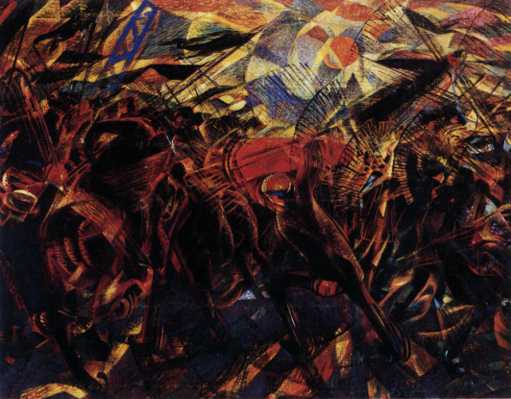 The Italian poet, Marinetti, published “The Founding and Manifesto of Futurism” in 1909, which inspired artists such as Carlo Carra and Umberto Boccioni to a further stage of abstraction and profoundly influenced art movements throughout Europe. Marinetti expressed a passionate loathing of everything old, especially political and artistic tradition. “We want no part of it, the past”, he wrote, “we the young and strong Futurists!” The Futurists admired speed, technology, youth and violence, the car, the airplane and the industrial city, all that represented the technological triumph of humanity over nature, and they were passionate nationalists. They repudiated the past and all imitation, praised originality, “however daring, however violent”, bore proudly “the smear of madness”, dismissed art critics as useless, rebelled against harmony and good taste, swept away all the themes and subjects of all previous art, and gloried in science. 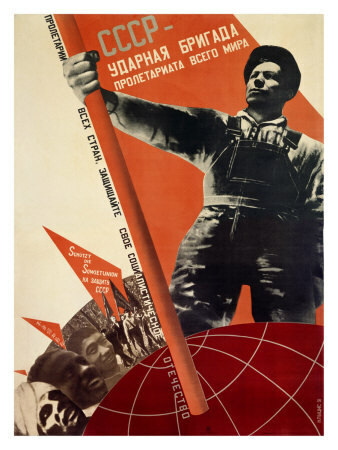 Constructivism began as a Soviet youth movement. The Russian Revolution of 1917 involved many Russian artists, who combined political propaganda and commercial advertising in support of the new communist revolution. The Russian Revolution is the collective term for a series of revolutions in Russia in 1917, which destroyed the Tsarist autocracy and led to the creation of the Soviet Union. The Tsar was deposed and replaced by a provisional government in the first revolution of February 1917. In the second revolution, during October, the Provisional Government was removed and replaced with a Bolshevik (Communist) government. Many artists, excited by the promise of equality under Communism, designed posters and packaging intended to attract buyers to state products. Advertising became a means for artists, poets, and others to advance the goals of Soviet society. 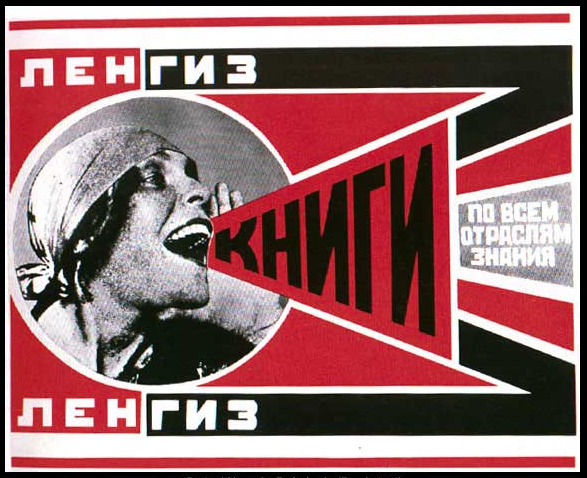 Alexandr Rodchenko, Liubov Popova, and others were abstract painters / graphic designers whose political philosophy fit with and adapted to advertising propaganda for the good of Soviet society. Rodchenko worked in a variety of media, including filmmaking and set and costume design for film and theater. He designed posters for several films using the new technique of photo collage. El Lissitzky was a Russian constructivist and designer who devoted a great deal of effort to propaganda work. He also developed rules of typography and design that laid the groundwork for the development of grid systems. He experimented with photography and foresaw the importance photography would come to have in graphic design. This innovative thinking and design work in the Soviet communist revolution spread its artistic vision to other countries. 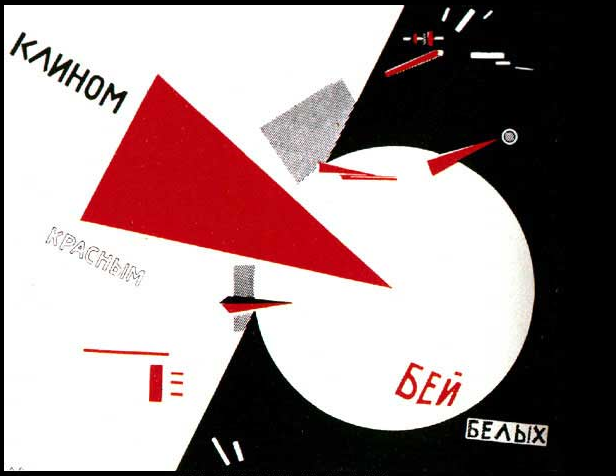 El Lissitzky, Drive The Red Wedge Into The White Troops! Closely related to constructivism, de Stijl developed in Holland, where artists fled to avoid involvement in World War I. De Stijl flourished during the 1920s in Europe and strongly influenced the Bauhaus work. De Stijl was anti-emotion, concerned only with formal aesthetic problems. The most widely know painters of the period are Piet Mondran and Theo van Doesburg. Their style is the epitome of de Stijl, with straight black lines set at right angles to one another and a careful asymmetrical balancing of primary colors. The reduced components of line, plane, and color strongly influenced graphic design. The Bauhaus was a school in Germany that combined crafts and the fine arts, and was famous for the approach to design that it publicized and taught. It operated from 1919 to 1933. 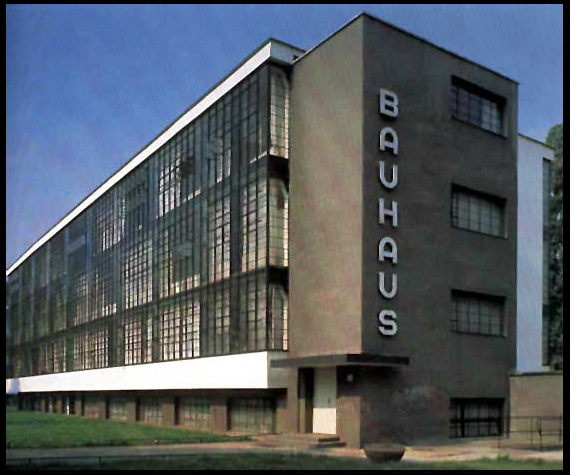 Bauhaus means “house of construction” or “school of building” in German. The Bauhaus school was founded by Walter Gropius in Weimar, Germany. In spite of its name, and the fact that its founder was an architect, the Bauhaus did not have an architecture department during the first years of its existence. Nonetheless it was founded with the idea of creating a ‘total’ work of art in which all arts, including architecture would eventually be brought together. The Bauhaus style became one of the most influential currents in modern architecture and modern design. The Bauhaus has had a profound influence upon later developments in art, architecture, graphic design, interior design, industrial design, and typography. Expressionism, Dada, Constructivism, and de Stijl influenced the Bauhaus faculty and students. It’s weavers, furniture designers, and metal smiths did not try to create works of art but rather good and useful designs in which form was tied to function. Graphic design faculty also emphasized clean functional design. The profession of industrial designer was born from this movement. Bauhaus publications featured asymmetry, a rectangular grid structure and sans-serif type. Josef Albers is known for his research into color. László Moholy-Nagy developed photography as illustration. Herbert Bayer created several typeface designs including Universal. In keeping with the Bauhaus philosophy, he believed in removing personal values from the printed page, leaving it purely logical and functional in design. After the Nazis forced the closing of the Bauhaus in 1933, many of its artists immigrated to the United States. There they greatly influenced American architecture and graphic design. László Moholy-Nagy came to Chicago in 1937 and opened the New Bauhaus. The New Bauhaus closed after only a year but Moholy-Nagy converted it into the Institute of Design and ran it until 1946. This school offered the first complete modern design curriculum in America. The Illinois Institute of Technology is a descendant of the New Bauhaus. Note: The Harvard Art Museum has a new Bauhaus collection available online. It’s the largest and most comprehensive source of Bauhaus history and images available anywhere. The release of this collection marks the beginning of a broader celebration in 2019, marking the 100th anniversary of the Bauhaus school’s founding. After the war, the Swiss continued to develop the ideas of the Bauhaus in typography and layout. 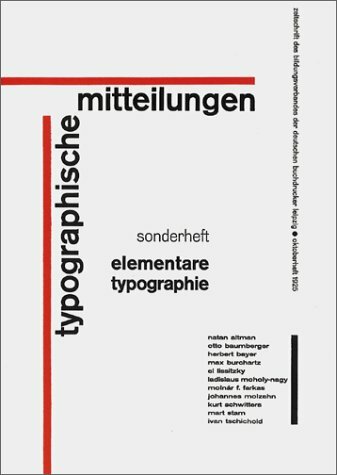 New Typography or International Typographic Style or Swiss Design are terms that identify newer Bauhaus-inspired approaches to graphic design. Jan Tschichold ( 1902 1974 ) was a typographer, book designer, teacher and writer, who was a major force in this style. In 1923 he visited the Bauhaus exhibition in Weimar. Influenced by the new Bauhaus typography, Tschichold began to use serifless typefaces and designed simplified layouts. New Typography uses white space to create visual intervals in an asymmetrical layout. An underlying grid unifies the page. Personal expression is rejected in favor of order and clarity. The predominant graphic design style in the world by the 1970s, the Swiss style is recognizable by its strong reliance on typography, usually sans serif type in flush left alignment. Modernism was a revolt against the conservative values of realism. Modernists believed that each new generation must build on past styles in new way or break with the past in order to make the next major contribution. Modernism is associated with innovation and progress. Many modernists believed that by rejecting tradition and embracing new technology they could invent new ways of making art. Despite the fact that early practitioners rejected consumerism, modernism has flourished in consumer/capitalist societies. Modernism even began to fuse with consumer culture during the 1960s. This merging of consumer and the original idea of modernism led to a radical transformation of the meaning of “modernism.” It seems that a movement based on the rejection of tradition has become a tradition of its own. Pingback: Modernism – Hong Dang Ng. Wonderful site, I am grateful for comprising this incredibly useful information! prof premraj pushpakaran writes—— 2019 is 100th anniversary of the founding of the Bauhaus!!! Pingback: How have ideas informed practice in the Bauhaus movement? Jocuri, my sources are credited at the bottom of each page. If you are interested in this topic, I suggest you visit those websites for more indepth info. My little blog just skims the surface of what has been written about design history. I appreciate all thoughtful comments and suggestions. after reading through a lot of responses on Modernism | Graphic Design History. I do have some questions for you if it’s allright. Is it simply me or do some of the responses look like they are coming from brain dead visitors? 😛 And, if you are writing on other social sites, I would like to keep up with anything fresh you have to post. Would you make a list of the complete urls of all your social networking pages like your twitter feed, Facebook page or linkedin profile?